No dental emergencies ever happen when it’s convenient. Fortunately, Even better, “emergency dentistry” and “affordable dental care” are synonymous at East Indy. Basically, if it happens suddenly and causes debilitating pain or if it threatens the health of the tooth, it’s an emergency and needs to be addressed immediately. An abscess, chipped or broken tooth, dislodged tooth (partially knocked-out), knocked-out tooth, lost crown or filling, objects lodged between teeth or severe toothaches all mean you need to get to the dentist as soon as possible. If there’s damage or loss, gather the pieces and get to the dentist — a lost tooth can be reinserted, but success rates drop fast after an hour; crowns can be repaired; lost fillings need to be replaced. An abscess is doubly dangerous, it’s an infection that can damage a tooth or spread to other parts of the body. Generally speaking, over-the-counter pain relievers — acetaminophen, aspirin or ibuprofen — can relieve some of the pain temporarily, but that’s no substitute for dental care. And never place aspirin directly on an aching tooth, the aspirin can burn your gum tissues. No one puts “emergency dental care” in their monthly budget and we never want to turn a patient away for financial reasons. We always strive for affordable dental care and we’ve made it our business to provide options that can work for your situation. CareCredit is a nationally-recognized dental credit option through which you can finance your emergency dental treatment. Since 1987, CareCredit and their 200,000 healthcare provider partners have helped millions of Americans afford unexpected tooth care as well as elective and cosmetic dentistry and general medical expenses. Likewise, East Indy Dental Care has in-house financing for Indianapolis dental patients with no insurance — providing flexible access to quality dental care for the whole family. Our in-house plan has a low annual membership for individuals which includes preventive appointments and exams and offers discounts on all restorative treatments. Additional family members can be enrolled for a reduced membership fee. When evaluating any products or services, you should look at the whole package. East Indy Dental Care serves the greater Indianapolis area with a full range of affordable family dental treatments. Our team of professionals comes equipped with the credentials and experience to serve you. We strive for pain-free dentistry and when-you-need-it emergency dental care. Contact us today for more information! Dr. LeClere and her staff offer the best, most caring dental care we have ever experienced. She is great with kids of all ages as well as with kids and adults with special needs. Attentive caring people who never leave your kiddos sitting for long lengths of time alone allowing the numbing to wear off. They are gentle with kids and makes sure whoever is in the chair is completely numb before doing work! It is obvious the staff has a great rapport and the whole atmosphere of the place reflects it. We have been going here for years and are so thankful to have found a wonderful dentist after more than one bad experience! Very thoughtful, considerate and friendly. I just moved here a few months ago and I must say I found a great dentist!!! My kids and I come here and I have a autistic son and usually he's skeptical about the dentist but he came out smiling after his procedure, they were very patient and understanding with him and I truly appreciated that. Highly recommended! Had my first visit at their office yesterday. I had not been clear when booking my appointment that I needed a cleaning. Once the exam was finished, the hygienist was kind enough to work me in and get it done. The whole staff was extremely friendly and professional. I would highly recommend their office if you are looking for a new dentist. Nice, friendly... They really care about the health of you teeth and gums. I have had several visits. I hadn't had dental care since I was about 14. I have a lot of anxiety going to the dentist. They have been great! They have my teeth looking better than they ever have. They take HIP which is also a plus! Had my fist appointment today. I haven't seen a dentist in 12 years so I had 14 cavaties! Theyy made me feel right at home, judgment free! Dr. LeClere and her staff are the friendliest people that i have met and I have already recommended her to a fellow nurse that I work with. By far the best dental experience that I have ever had (besides cavity news). Great staff, wonderful Doctor. Highly recommend these folks. 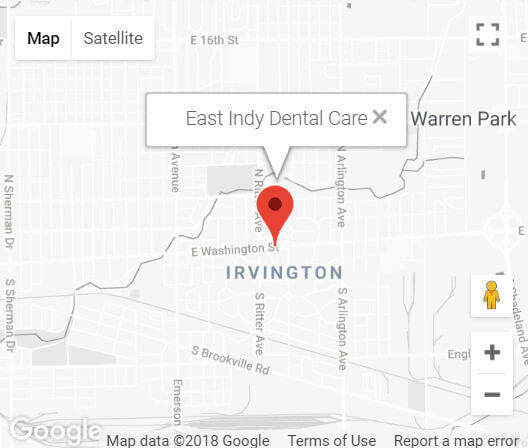 Highly recommend East Indy Dental and their beautiful new facility in Irvington. Dr. LeClere is an outgoing, wonderful dentist; she performed my wisdom tooth extraction last year and even checked on me after-hours to make sure I was doing well. I really appreciated that and she didn't have to do it. I've interacted with a number of her staff, and they are all friendly, courteous, and knowledgeable, and I appreciate them because they do a lot of work! This the place to go for dentistry in Indianapolis! The office staff was so nice. It was a clean space! They were up front about pricing. I would suggest East Indy Dental Care. First time I’ve been to this dentist very pleased all of the assistants and doctors were very friendly and personable very informative also with all of the questions that I had. facility was clean and well taken care of. To the comment that said they were moving around too fast that’s called being efficient and they were great at it would you rather sit in the chair for 45 minutes waiting on someone to attend to you. All-around pleasant experience great job👍. Would highly recommend to everyone. Thank you Dr. LeClere. Copyright East Indy Dental Care, All Rights Reserved.